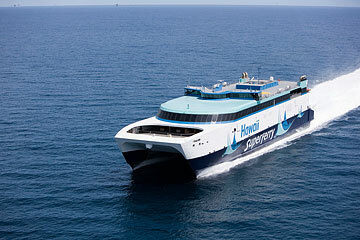 Hawaii Superferry's first interisland vessel is under way to Hawaii, having left Mobile, Ala., yesterday. The Alakai's 7,600-mile sojourn can be tracked online from Mobile, through the Panama Canal, to Los Angeles for refueling and ultimately, to the islands. "Hawaii Superferry's inauguration of interisland service will mark the beginning of a new and exciting era for Hawaii," said John Garibaldi, president and chief executive officer. Garibaldi said the Superferry is expected to arrive in early July and begin service by the end of August. Before its maiden voyage, however, the vessel's crew will ship out for route familiarization and other training required for U.S. Coast Guard certification. The community will be allowed on board during stop-overs on Oahu, Kauai, Maui and the Big Island before service begins. Seven Hawaii residents are among the dozen Hawaii Superferry officers and crew members stewarding Alakai's sail to the islands. Three Honolulu-based maintenance staff members, three manufacturers' representatives and a cook are also on board. Garibaldi said he couldn't be more specific on the start of Hawaii service because of delays the Superferry could experience going through the Panama Canal. "It could take a day, it could take a week to get through," he said. "The Panama Canal is doing some maintenance work with the locks where people are traversing and there's a backlog of vessels trying to get through." Locks are part of the canal mechanism that allows vessels to go through the various levels of elevation in Panama, Garibaldi said. The Alakai will provide 3-hour trips between Maui and Oahu and Kauai and Oahu from Sunday through Friday. A second ferry, to begin service in 2009, will sail between the Big Island and Oahu, a 4-hour, 15-minute trip. It will also offer a second daily Oahu-to-Maui round-trip.